Stephen Williamson weighed in on nominal GDP targeting in a blog post on Monday. Scott Sumner and Marcus Nunes have already responded, and Williamson has already responded to Scott, so I will just offer a few semi-random comments about Williamson’s post, the responses and counter-response. The Taylor rule takes as given the operating procedure of the Fed, under which the FOMC determines a target for the overnight federal funds rate, and the job of the New York Fed people who manage the System Open Market Account (SOMA) is to hit that target. The Taylor rule, if the FOMC follows it, simply dictates how the fed funds rate target should be set every six weeks, given new information. So, from the mid-1980s until 2008, everything seemed to be going swimmingly. Just as the inflation targeters envisioned, inflation was not only low, but we had a Great Moderation in the United States. Ben Bernanke, who had long been a supporter of inflation targeting, became Fed Chair in 2006, and I think it was widely anticipated that he would push for inflation targeting with the US Congress. The Friedman rule . . . dictates that monetary policy be conducted so that the nominal interest rate is always zero. Of course we know that no central bank does that, and we have good reasons to think that there are other frictions in the economy which imply that we should depart from the Friedman rule. However, the lesson from the Friedman rule argument is that the nominal interest rate reflects a distortion and that, once we take account of other frictions, we should arrive at an optimal policy rule that will imply that the nominal interest rate should be smooth. One of the frictions some macroeconomists like to think about is price stickiness. In New Keynesian models, price stickiness leads to relative price distortions that monetary policy can correct. If monetary policy is about managing price distortions, what does that have to do with targeting some nominal quantity? Any model I know about, if subjected to a NGDP targeting rule, would yield a suboptimal allocation of resources. I really don’t understand this. Williamson is apparently defending current Fed practice (i.e., targeting a rate of inflation) by presenting it as a practical implementation of Friedman’s proposal to set the nominal interest rate at zero. But setting the nominal interest rate at zero is analogous to inflation targeting only if the real rate of interest doesn’t change. Friedman’s rule implies that the rate of deflation changes by as much as the real rate of interest changes. Or does Williamson believe that the real rate of interest never changes? Those of us now calling for monetary stimulus believe that we are stuck in a trap of widespread entrepreneurial pessimism, reflected in very low nominal and negative real interest rates. To get out of such a self-reinforcing network of pessimistic expectations, the economy needs a jolt of inflationary shock therapy like the one administered by FDR in 1933 when he devalued the dollar by 40%. It will be a cold day in hell when the Fed adopts NGDP targeting. Just as the Fed likes the Taylor rule, as it confirms the Fed’s belief in the wisdom of its own actions, the Fed will not buy into a policy rule that makes its previous actions look stupid. So is Williamson saying that the Fed will not adopt any policy that is inconsistent with its actions in, say, the Great Depression? That will surely do a lot to enhance the Fed’s institutional credibility, about which Williamson is so solicitous. Then Williamson makes another curious argument based on a comparison of Hodrick-Prescott-filtered NGDP and RGDP data from 1947 to 2011. Williamson plotted the two series on the accompanying graph. Observing that while NGDP was less variable than RDGP in the 1970s, the two series tracked each other closely in the Great-Moderation period (1983-2007), Williamson suggests that, inasmuch as the 1970s are now considered to have been a period of bad monetary policy, low variability of NGDP does not seem to matter that much. 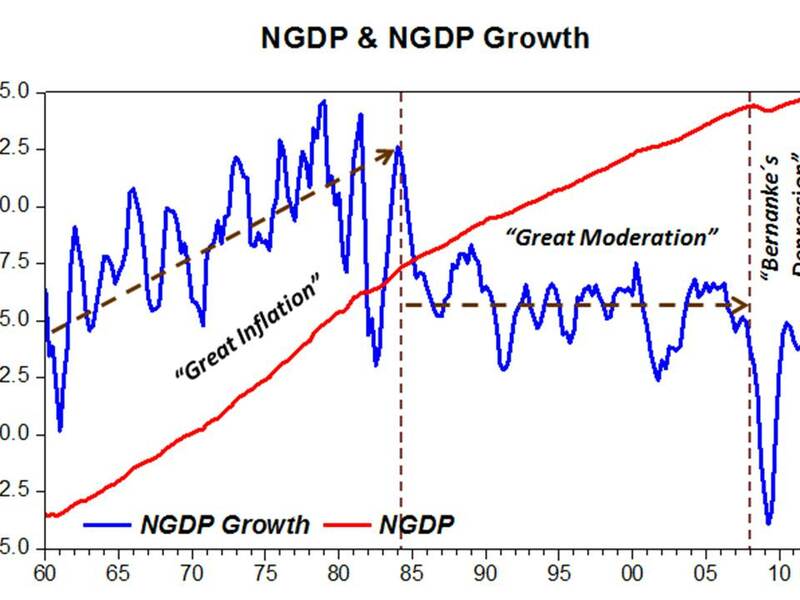 Marcus Nunes, I think properly, concludes that Williamson’s graph is wrong, because Williamson ignores the fact that there was a rising trend of NGDP growth during the 1970s, while during the Great Moderation, NGDP growth was stationary. 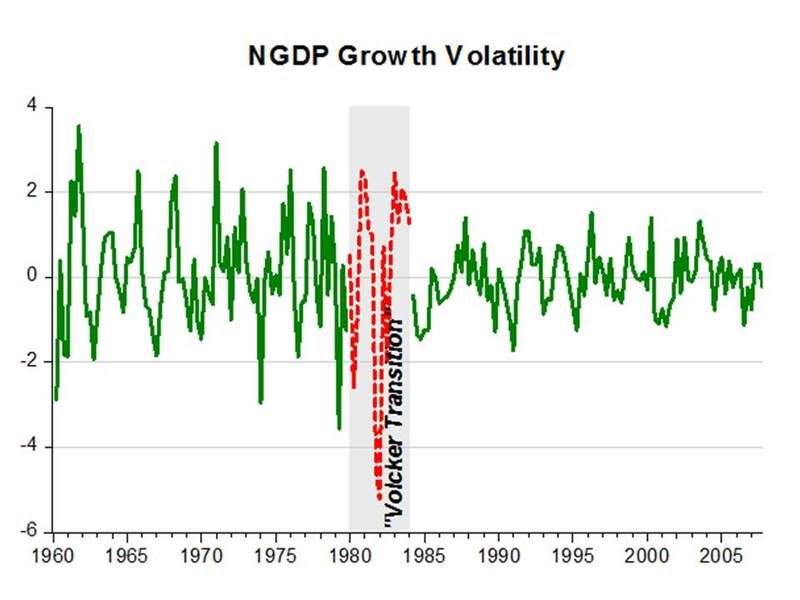 Marcus corrects Williamson’s error with two graphs of his own (which I attach), showing that the shift to NGDP targeting was associated with diminished volatility in RGDP during the Great Moderation. Furthermore, Scott Sumner questions whether the application of the Hodrick-Prescott filter to the entire 1947-2011 period was appropriate, given the collapse of NGDP after 2008, thereby distorting estimates of the trend. There may be further issues associated with the appropriateness of the Hodrick-Prescott filter, issues which I am certainly not competent to assess, but I will just quote from Andrew Harvey’s article on filters for Business Cycles and Depressions: An Encyclopedia, to which I referred recently in my post about Anna Schwartz. Here is what Harvey said about the HP filter. Thus for quarterly data, applying the [Hodrick-Prescott] filter to a random walk is likely to create a spurious cycle with a period of about seven or eight years which could easily be identified as a business cycle . . . Of course, the application of the Hodrick-Prescott filter yields quite sensible results in some cases, but everything depends on the properties of the series in question. The seasonality question is interesting. We could push it further. Should we want the same level of NGDP on weekends as during the week? What about nighttime? But then I think the same question could be asked for inflation targeting, or price level path targeting, because there is a seasonal pattern to CPI too. And (my guess is) the CPI is higher on weekends. Not sure if the CPI is lower or higher at night. Actually, thinking about seasonality is a regular repeated shock reminds me of something Lucas once said about rational expectations equilibria. I don’t remember his precise words, but it was something to the effect that we should be very wary of assuming the economy will hit the RE equilibrium after a shock that is genuinely new, but if the shock is regular and repeated agents will have figured out the RE equilibrium. Seasonality, and day of the week effects, will be presumably like that. So, I think the point about eliminating seasonal fluctuations has been pretty much laid to rest. But perhaps Williamson will try to resurrect it (see below). In his reply to Scott, Williamson reiterates his long-held position that the Fed is powerless to affect the economy except by altering the interest rate, now 0.25%, paid to banks on their reserves held at the Fed. Since the Fed could do no more than cut the rate to zero, and a negative interest rate would be deemed an illegal tax, Williamson sees no scope for monetary policy to be effective. Lars Chritensen, however, points out that the Fed could aim at a lower foreign exchange value of the dollar and conduct its monetary policy via unsterilized sales of dollars in the foreign-exchange markets in support of an explicit price level or NGDP target. My point in looking at seasonally adjusted nominal GDP was to point out that fluctuations in nominal GDP can’t be intrinsically bad. I think we all recognize that seasonal variation in NGDP is something that policy need not be doing anything to eliminate. So how do we know that we want to eliminate this variation at business cycle frequencies? In contrast to what Sumner states, it is widely recognized that some of the business cycle variability in RGDP we observe is in fact not suboptimal. Most of what we spend our time discussing (or fighting about) is the nature and quantitative significance of the suboptimalities. Sumner seems to think (like old-fashioned quantity theorists), that there is a sufficient statistic for subomptimality – in this case NGDP. I don’t see it. So, apparently, Williamson does accept the comment from Nick Rowe (quoted above) on his first post. He now suggests that Scott Sumner and other NGDP targeters are too quick to assume that observed business-cycle fluctuations are non-optimal, because some business-cycle fluctuations may actually be no less optimal than the sort of responses to seasonal fluctuations that are general conceded to be unproblematic. 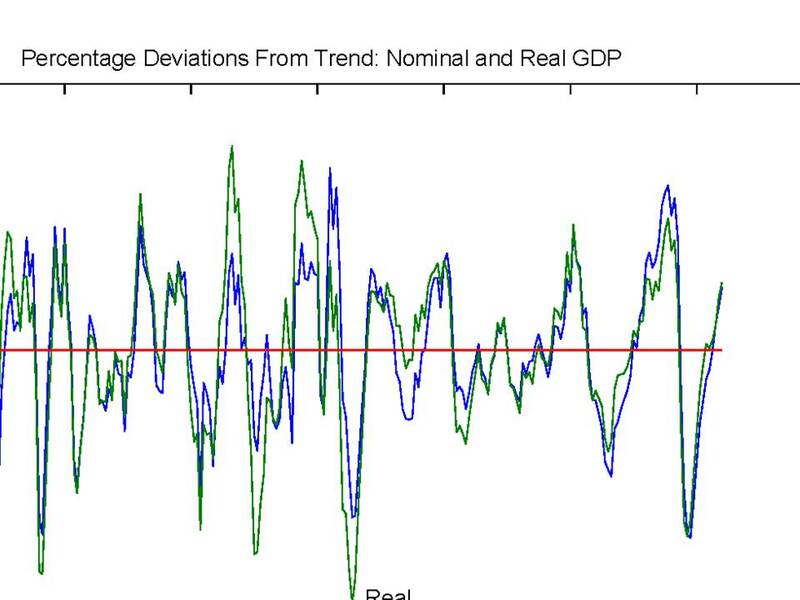 The difference, of course, is that seasonal fluctuations are generally predictable and predicted, which is not the case for business-cycle fluctuations. Why, then, is there any theoretical presumption that unpredictable business-cycle fluctuations that falsify widely held expectations result in optimal responses? The rational for counter-cyclical policy is to minimize incorrect expectations that lead to inefficient search (unemployment) and speculative withholding of resources from their most valuable uses. The first-best policy for doing this, as I explained in the last chapter of my book Free Banking and Monetary Reform, would be to stabilize a comprehensive index of wage rates. Practical considerations may dictate choosing a less esoteric policy target than stabilizing a wage index, say, stablizing the growth path of NGDP. I think I’ve said more than enough for one post, so I’ll pass on Williamson’s further comments of the Friedman rule and why he chooses to call himself a Monetarist. PS Yesterday was the first anniversary of this blog. Happy birthday and many happy returns to all my readers. Williamson was awful in his arguments, both technical and economic wise. Which just opens up more opportunities for the MM´s to push the argument. One year already. Seems like it was yesterday that I first commented on your first post. Congrats! David, It has been a fantastic first year! Concrats – you have been and remain a major inspiration for me. Thanks. Marcus, I remember it well. The year flew by, didn’t it? You taught me a lot about blogging, and I really am grateful to you for your help and your interest. Lars, Thanks so much. I think you have far surpassed me as a blogger, so I am honored to be considered an inspiration. A very good counter-critique, though I do wonder just what the political barries to nominal wage targeting are? I’ve seen both you and Sumner mention that you think it is the better policy vs. NGDP targeting and that there are non-economic reasons to favour NGDP targeting instead, but what exactly are they? Congratulations on your first year! I like the focus on the history of economics and the fairly heavy but pleasantly chewable style of posts you have. Every blog post is distinctive and thought-provoking. If inflation expectations are inherently unstable, then you don’t need a policy instrument to cause a change. Change is automatic. It follows that the central bank can increase inflation expectations simply by setting a level target, even at the zero bound. The CB can always inflate, it just can’t always hit its preexisting target, if that would require a negative interest rate. It has to change the target. Thanks for taking the time to publish an interesting and insightful blog! for this antipodean central banker, your blog has become a very useful and stimulating resource. Yours is a wide ranging blog that shows the eventful life you have had. Looking forward to the next year! I love your style (as well as the discussion)! Will there be a kindle version of your book? I’d like to read it and am overflowing with physical books so I go electronic when I can to save the space. You’re doing a great job–informative, enlightening, and even entertaining. Thanks for what you’ve done, and please keep it up! The difference between seasonality fluctuations & price movements vs business cycle/monetary/price movements was the topic of Hayek’s famous 1928 paper “Intertemporal Price Equilibrium and Movements in the Value of Money”, the paper which introduced dated goods, pioneering the move from timeless GE to Intertemporal Equilibrium. See Hicks or any good history of economic thought on the seminal role of this Hayek work & related papers on the development of economic science. Fantastic first year – congratulations! I’d put you up there with Laidler/ Dimand in the ‘historians of economic thought’ list. I personally asked him why the New Monetarist tag-I really was curious if this is some kind of school-and he said that why can’t he call himself a two-headed frog if he wants. W. Peden, Actually, I am not sure what the barriers are other than that the idea has never attracted much support. I worry that a policy of stabilizing wage rates might be a bit too deflationary in practice, even though the theory says it would be just right. So, on my part, it’s just my general skepticism about reform of any type getting the better of me. And thanks for your generous comments about the blog. Commenters like you are one of the real rewards of having a blog. Max, Inflation expectations may be unstable, but that doesn’t mean that they aren’t affected by policy. But we seem to agree that the CB can accomplish a lot by explicitly setting a target. David, Thank you. I have greatly benefited from you interesting an insightful comments even though we have often disagreed. I hope that we will continue our discussion in the coming year. Michael, Thanks so much, I am glad and honored to be of service. Becky, I don’t know how eventful, but I have met and gotten to know some very outstanding economists whose insights I hope that I have benefitted from and hope that I can transmit to my readers. Thanks for being a regular reader and commenter. dajeeps, My book was published almost 25 years ago. A paperback edition only came out only about 5 or 6 years ago. I actually don’t know if there is any electronic version of the book available. Why not check with my publisher Cambridge University Press? Philo. You’re very kind, and I will try my best, but I am always worrying that I don’t have anything left to write about. Greg, I know about and have referred to the paper you cite, and it is indeed a seminal paper in the history of economic thought. My knowledge of it is mostly second hand, however, and I was not aware until recently that he discussed the distinction between seasonal and business-cycle fluctuations. I will try to have a look some time. Ritwik, Laiidler and Dimand are two scholars whose work I greatly admire, and I am very honored to be put on the same list that they appear on. Please keep reading and commenting. Mike, I saw that exchange on his blog. I’m afraid that I don’t know what to make of his response. If you start with the premise (in a modern economy) that price stability (to avoid relatively minor suboptimal allocation of resources) is the goal of monetary policy, then you are assuring your nation of a Japan situation. Japan has had minor deflation—indeed, roughly what some might regard as “good deflation” brought about by productivity increases—for 20 years. It has been a colossal dud. I will tell you (especially Williamson, who needs remedial instruction) the goal of macroeconomic policy: To promote real growth, by any means necessary (recognizing that the price signal misses pollution, and certain social needs). Furthermore, I contend that those braying about suboptimal allocation of resources due to inflation are just currency fetishists and gold-nuts in drag. Seriously, suboptimal resource allocation due to 5 percent inflation a year? In the age of the Internet? When goods and services are so complicated anyway I can hardly tell if I am getting a great deal or rooked every time I get my car or body fixed, or pay an accountant or lawyer? Buy a house? What is a bottle of wine worth? Crickey, this is arrant nonsense. Goods and services are usually manufactured and packaged precisely to differentiate, and avoid price comparisons. Happy blog birthday to one of the ‘net’s best economic commentators! Benjamin, Thanks for the kind wishes and praise. As you usual, I respond in my wishy washy way, that price stability or even falling prices may be desirable under some circumstances. In the situation we face today, inflation is the thing. It all depends. Saturos. Thanks to you as well. Actually, Scott does link to me except that his link is to Hawtreyblog (my alternative domain name). But hardly anybody refers to it that way, so perhaps I should ask him to change it my name or to the better known name. Yes I like to follow this Blog a lot. Sometimes it’s way above my head. But I all try to keep up with my readings. Tas, Thanks. A good way to learn is by reading stuff that’s over your head, but not too far over your head.